According to local reports , Progressive Socialist Party official website commented on Sunday’s rally by saying: “The Half of Lebanon that was in the rally could not be ignored or allowed to be unnoticed despite the slogans and some of the provocative remarks that were made”. PSP which reportedly described the gathering as a huge demonstration said “we cannot ignore their demands specially with regards to the use of arms internally for securing political gains “. lets unite the country and get rid of all the other states and armies .” the organizers said in reference to Hezbollah’s state within the state of Lebanon and the non-state ( illegal) arms. Mikati was appointed in January as the PM designate with the backing of the Hezbollah March 8 alliance and MPs Walid Jumblatt and Mohammad Safadi following the collapse of Hariri’s unity government. March 14 leaders have repeatedly said that intimidation from Hezbollah’s weapons helped secure the parliamentary majority for Mikati’s nomination. 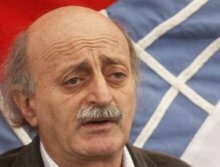 Jumblatt and his PSP parliament members reportedly switched allegiance to Hezbollah’s PM candidate, following threats by Hezbollah. Jumblatt, Mikati and Safadi were all elected on March 14 electoral tickets during the 2009 parliamentary elections. Jumblatt who heads the Progressive Socialist Party announced last week that he planned to boycott the rally ( even though he was not invited) but many of his supporters within his PSP and the Druze community were there according to local reports. WELL HELLO YA HIBLAN FIRST THING FIRST HALF THE NATION OUT PROTESTING AGAINST HEZBOLLAHS WEAPONS WHAT A TYPICAL ZIONIST LIE.HOW MUCH DOES MARTYS SQUARE FIT 20-30,000?SHOW US THE PICTURES OF 1.5MILLION PROTESTING U IDIOTS AND NOT PICTURES THAT HAVE BEEN EDITED.REAL LIVE VIDEO RECORDINGS.SECONDLY HOW AMAZING THAT UR PUPPET PAPER CLAIMS TO HAVE THE STORY According to local reports , Progressive Socialist Party official website commented on Sunday’s rally by saying: “The Half of Lebanon that was in the rally could not be ignored or allowed to be unnoticed despite the slogans and some of the provocative remarks that were made”.BEFORE ANYONE ELSE DID.THIRDLYon-state ( illegal) arms. Nobody can deny that the nation is divided but we (Lebanese NOT 8 NOR 14) are EXTREMELY tired with the old exhausted tired retired boring drooping faint run-down spent wasted worn-out rhetoric of Zionist this and Zionist that. When the Shia represented by Amal were exterminating the Palestinians in what became known as “7arb el mou5ayamaat” was that a zionist plan executed by the Shia? So stop the BS of zionist labeling and stop your racist remarks and hatred against the Jews (Jew lovers as you say) because there is a difference between zionism and judaism. I know many Jews who are against apartheid in Israel and to insult them does not do your cause any good as Noam Chomsky who rallied with hezbollah many times is also a Jew you ignorant moron. Go screw yourself and we’re against the arms being used against Lebanese not Israel you stupid idiot. Stop talking about Jesus as if you jackasses know anything other than terrorizing people. And Last you can call me Zionist and don’t care. I hope Israel wipes Hezbollah from it foundation and take Syria and Iran with it too. quiet down you barking coward….we havn’t lost anything, its you who is loosing and has been loosing really since birth lol. Its time to pack your bags and wrap your head tight with your towel and head out east into the desert to join your long lost brothers. Lebanon is finally purging this filth that has been stuck to it for far too long! Im not a pro-Israeli person, but lets be honest here Israel seiged Beirut in 12-13 hours in 1982. That was 1982, if Israel wanted to waste your Hezbollah, Iran and Syria all they would have to do is take a little piss and youd blow with the wind. Your a 5 year old hiding behind the internet, look at your pathetic comment “LEAVE LEBANON AND GO LIVE IN TEXAS OR ANTARCTICA”. Firstly, they left Lebanon they withdrew from every piece of Lebanese land almost. Hezbollah officially has no legitimate excuse for their purpose, so theyir new excuse is “Hey lets make Beirut another Tehran”. Your so worthless go hide with your Nasrallah in a hole. Mabye if you had real balls youd show your face. Jesus would be ashamed and saddened be those who refuse to allow justice to be served and assassinations to continue. What he also meant to say is that 80% of the Druze population who went down to Martyr Square are not to be ignored either. Getting ready to change sides again walid? did you feel the heat already? preparing for next elections? It sounds like this bold headed snake felt the shaft from M8 and he is ready to jump ship. Maybe his master Shimon perez gave him his new orders. Jew and Zionist is like good and bad cop, but are the same goals of land grabbing, Hezbollah and Iran are after the same thing with a bonus–> imposing a Sharia State in Lebanon. Some have the tendency of incriminating Patriotic Lebanese like one or the other, But the objective is clear, Lebanese are tired of oppression, tired of living in chaos. And Patriotic Lebanese want freedom, We want to feel at ease, We want to work, make money and construct a Society without threats, We want to make Lebanon shine in the world, To share Our History victim of Plagiarism in which Jews and Islamic professors and writers are taking away Our achievements looting Our heritage. Historically after the year 642 when the Muslim expansion reached Lebanon but not able to control it, Lebanon was called the pocket of defeat, meaning that Islam was not able to conquest this Christian Land. Israelis use as a pretext of Land Grabbing the presence of HA. We are trapped in a dog fight for Our land. I ask You For Our Past, Present and Future stop Labelling each other and join forces, Embrace Liberty, I tell You “If important victories where easy to conquer anyone will do it” But is not easy and that I know, We loose precious time fighting among Ourselves than fighting the enemies who divide Our lives and Land. Embrace each other and shoulder with shoulder lets march together for the love of Our descendants, in Honour to the fallen Heroes, for Our past, Present and Future together will get rid of those who want to make You a puppet!